Happy May Day! We’re on day one of our 30-day digital detox but auto-posting select posts like this one. It’s with great joy to share our news about our old boy Domino turning fifteen. He’s the poster boy for adopting FIV+ cats. His story is one of survival, resilience and hope. 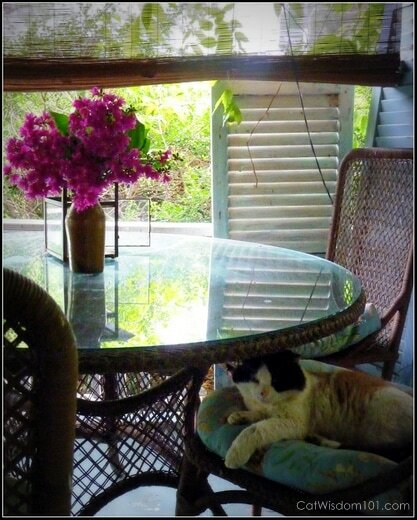 We don’t know where our former feral came from, but he showed upon our porch 14 years ago where he made his home for seven years. 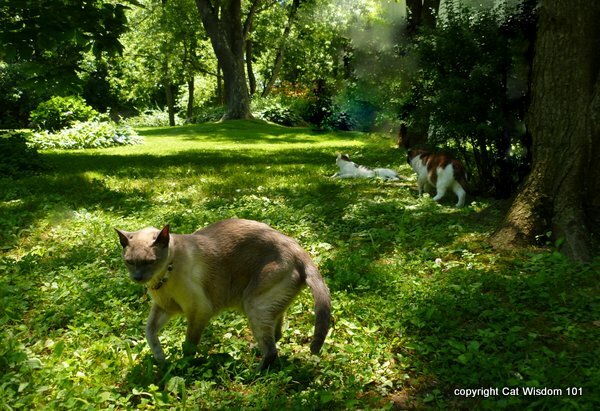 Domino shied away from humans but befriended Angel Merlin and Coco in 2004 and became fast friends with Odin and Merlin in 2011. 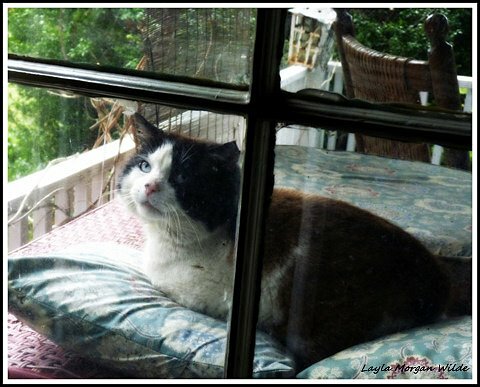 We made his porch life as comfortable as possible, and when he expressed interest in where his cat friends disappeared after their garden outings, we set up a spot by a window where he could spy inside. 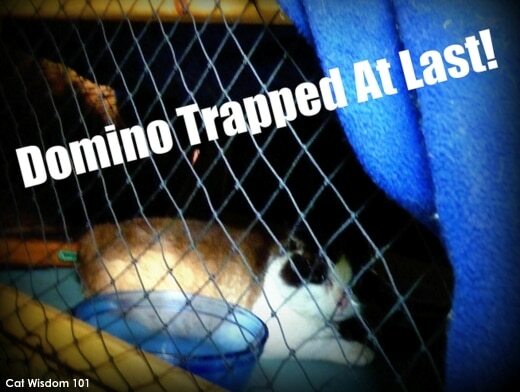 feral cat domino finally trapped and neutered. Gradually, Domino adjusted to indoor life to lap cat. 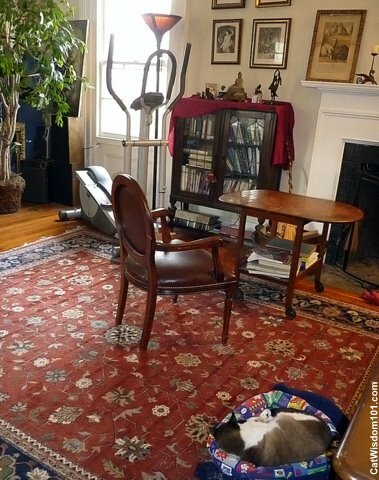 He’s a devoted daddy’s boy but enjoys the best of an indoor/outdoor lifestyle. Domino still has no interest in birthdays but won’t say no to catnip or treats. I hate birthdays and I hate being a senior but I love life and you! Thank you for being our friends. You’re welcome to partake in a celebratory toast and our best fishes. Free catnip for everyone! Can you identify all our gang at the birthday party bar including a few angels? 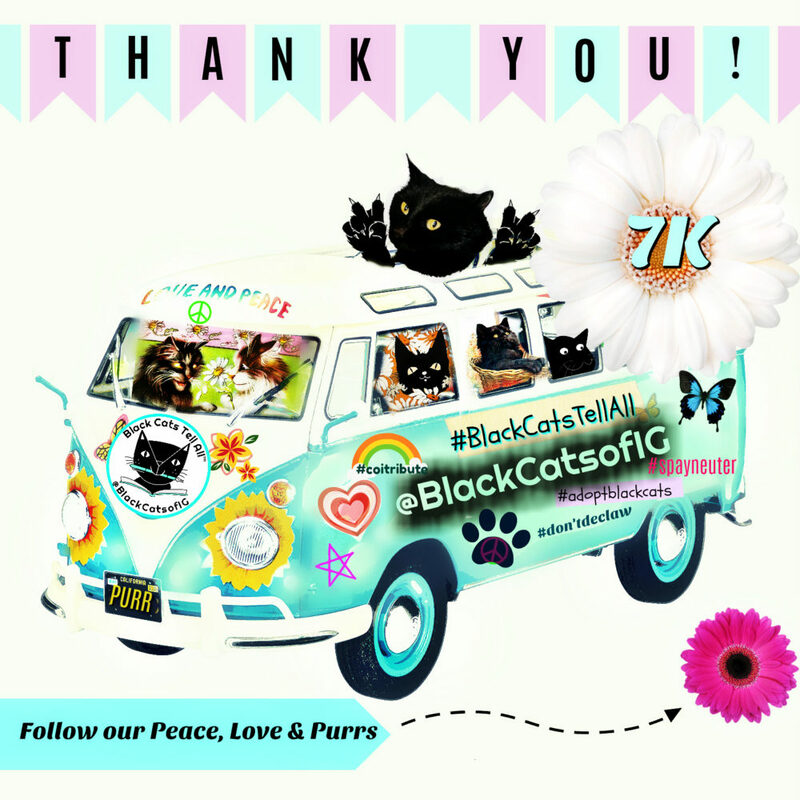 Thank you to all our followers on Instagram @CatWisdom101 and @BlackcatsofIG where we just celebrated 7000 followers. 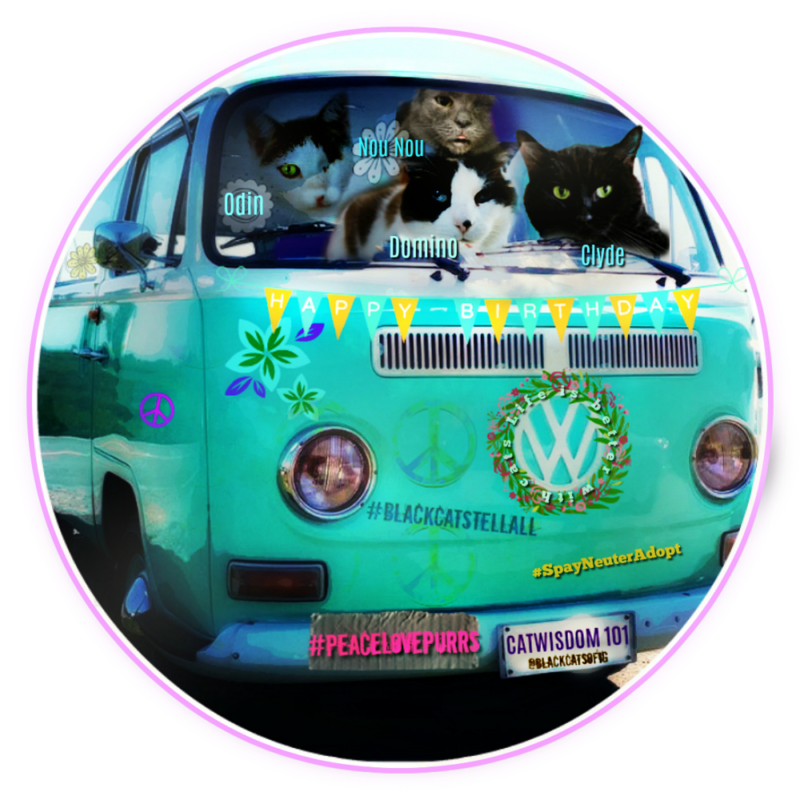 We loved the Coachella retro vibe of the hippie van and it inspired our birthday card. 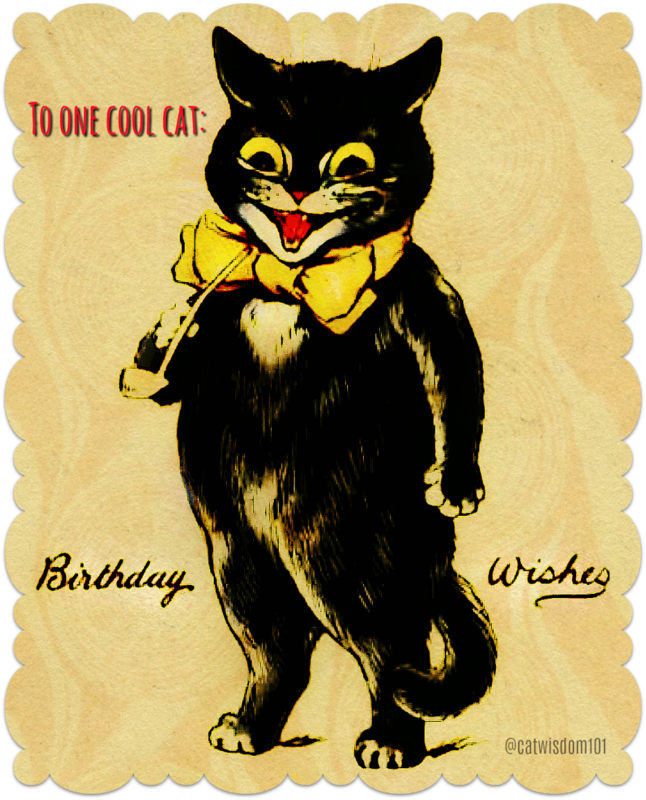 And if anyone needs a birthday card to send someone, we whipped up this cutie. Happy birthday to Domino from you New England buddies Mr. Buddy and Miss Lucky! Happy birthday, Domino! Enjoy your special day! 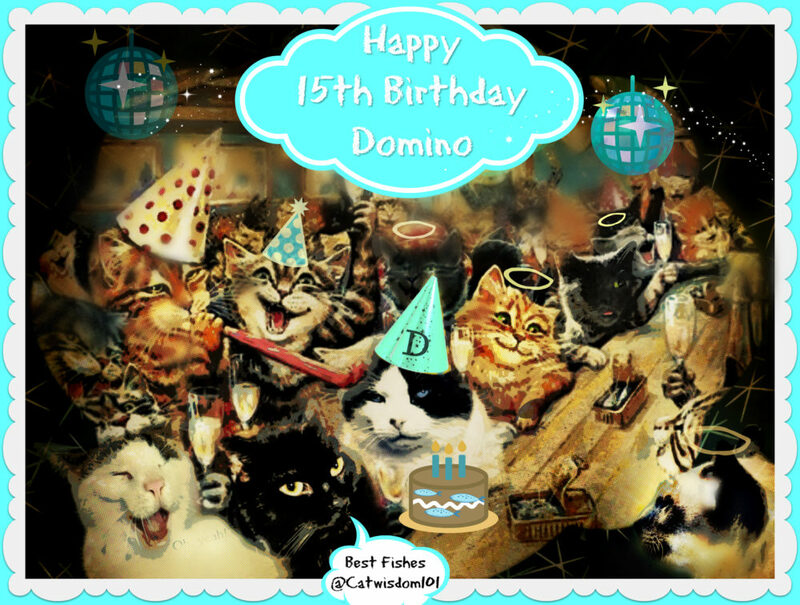 Happy 15th Birthday to Domino! 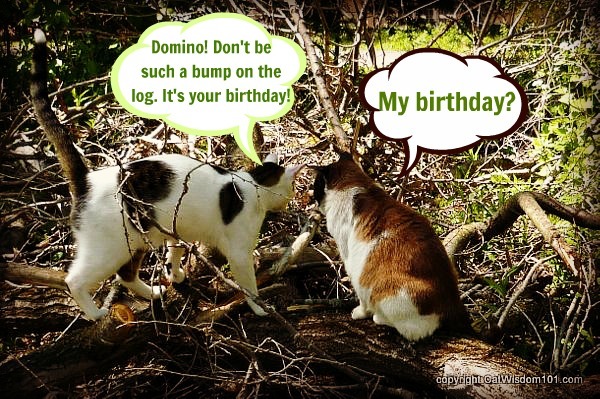 Happy Birthday Domino! 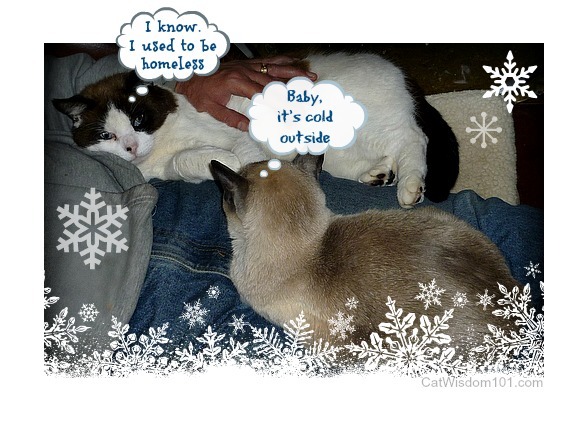 FIV cats are amazing, and former ferals too. Isn’t life a kick? Outside to inside and still enjoying the good life! Enjoy your day and enjoy the sunshine. Happy Birthday to YOU, Domino! I am not too far behind you at 13.5…MOL! Happy birthday Domino. Layla, enjoy your digital month off this month. Happy birthday, Domino! You’ve had quite a ride, and I hope it continues for a good, long while! You are proof that FIV kitties rule. 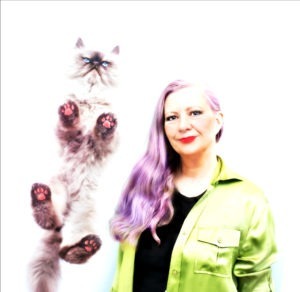 Happy birthday, dear Domino! We sure are glad you decided to come inside, and we are grateful for you and your friendship! Happy Birthdaty Domino!!! Hope you have a great day. I love digital detox. I rarely get those. I copy edit newspaper articles online. So I have digital nap breaks or TV breaks or errand breaks. This is a tough one and not taken off yet. Paws crossed all the details are done tonight. 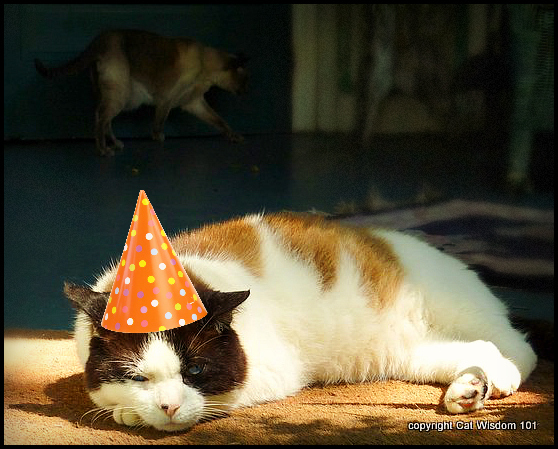 Happy Happy Cat Birthday Domino. (I secretly call you Dom Dom.) Ched looked up and winked and yawned, meaning that he wuvs you, too. Happy Birthday Domino! 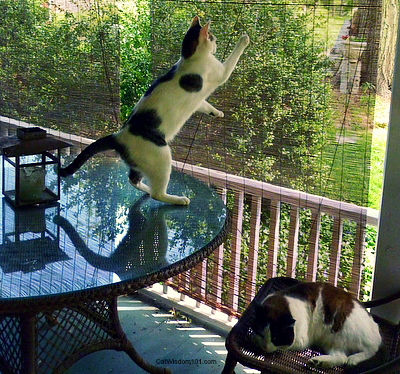 My Mom says she remembers the transition of outside visitor to inside lovin’ life kitty some years ago back when Sammy was still here. You look purrrrfectly happy being a man of leisure these days. Here’s to many more happy years for you big guy. Oh Domino! Happy Birthday, big guy, and you give me hope that maybe I’ll get The ‘O’ cats inside someday. Happy Birthday to you. Have a fun filled day. Happy Birthday from all of us Domino, you really are a special one!